The cold of winter is behind us and thoughts turn toward the joys of this first month of spring, with new life in farm pastures and valley fields. Agriculture has always been a defining element of our island lifestyle and, as with all things cultural, has been challenged by change. But our island’s sense of place is strong. Organizations like the San Juan Islands Agricultural Guild are actively creating rural history for the future with their many projects and events. When the Ag Guild envisioned the old Friday Harbor Brick and Tile building as the Brickworks we know today, their efforts preserved history and contributed to the future. What was once a center for building the structure of our community (literally in a concrete sense) is now a center for building the spirit of our community. As the home of the Farmers’ Market or when used as a festive gathering place for community fundraisers or weddings, Brickworks continues long-established traditions of the past. In that spirit, this month’s history column features three snapshots from farming days of earlier times. We see a total of seven or eight animals (look closely for a second cat, or maybe that’s just a rock) and five young people. 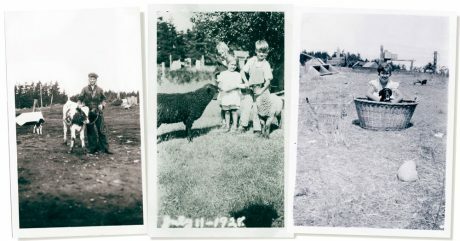 In the photo on the left, dated 1934, there is pride in the boy’s face for his calf. The center photo, dated 1928, appears sweetly staged with three children, perhaps siblings, bottle feeding their sheep. The undated photo on the right with a girl and puppy in a wicker basket raises a few questions. Just how many other animals are in that photo? What do you think? Please do let us know if you can identify any of these kids or their families. Island farm history is a major focus of The San Juan Historical Museum. Our new “museum within a museum” known as the Museum of History and Industry (MHI) will soon expand to interpret the importance of farming to island lifestyle. This permanent exhibit is a work in progress, along with other exhibits on fishing, logging, and the lime industry. There’s always something happening at the Historical Museum. Happy springtime, one and all!